I read three books in the first week of April and three books during the last week of April. 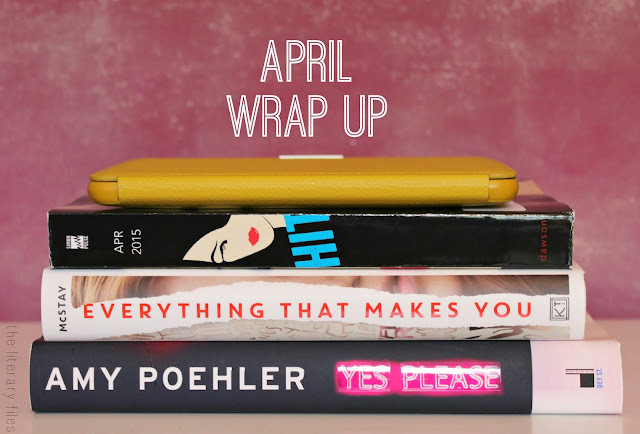 The middle of the month was filled with making pocket letters and watching Daredevil on Netflix. I truly didn't think I read six books this month, I'm pretty pleased with that number! I definitely have to give credit to Dewey's 24-Hour Read-a-Thon because that definitely got me out of my reading slump. I came out of April with a new favorite, Everything That Makes You and I'm still in total awe over how amazing it was. I'll be interviewing Moriah McStay, author of Everything That Makes You, this month! I read two new adult books, a memoir, a middle grade and two young adult books. I love how diverse the genres were for me this month, I usually just stick to young adult. I also put my Kindle to good use, I read three books on it in April. For May I'm planning on reading City Love by Susane Colasanti. I was also lucky enough to get an interview with Susane so that will go up this month too. I'm hoping to read Unteachable by Leah Raeder in May. I got this book as a birthday gift from the totally awesome Briana and I can't wait for one of our book talks! I recently finished Unteachable, I totally agree, such a good taboo topic!